A single piece probe made from tungsten carbide wire. The point is ground, not etched. Allowing for a larger point radius & tolerance. Dumet wire is the basic metal component of a Lead-in-Wire. A diode header wire. With required vacuum tight glass-to-metal seal. Dumet material with bendable shank and cat whisker pure tungsten tip. For general purpose probing, bendable shank & tip. Same as model 7B but with shorter overall length. 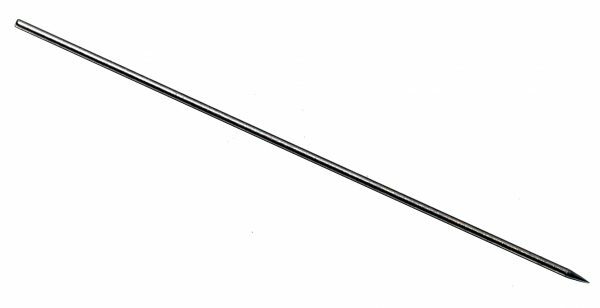 Sharp fine tip with bendable shank, for small geometry probing.